This template of a restaurant has exclusive offers in breakfast menu with varieties of skillets, sandwiches, eggs and cheeseburgers. It is best showcased on a digital menu board and placed either at the entrance or indoors of the restaurant. 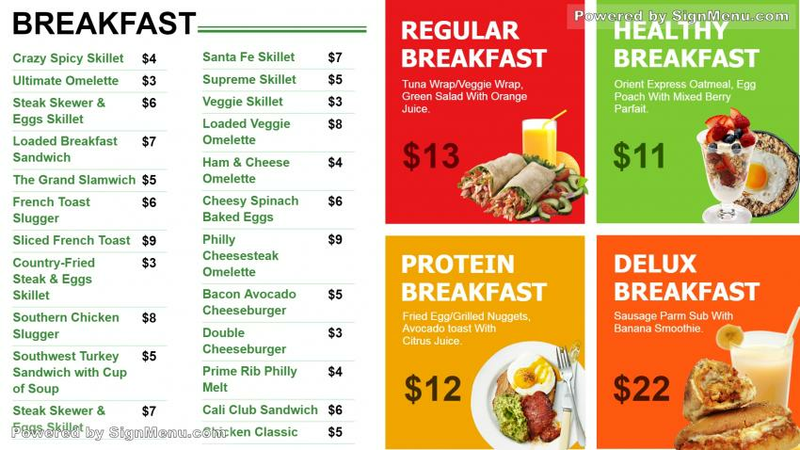 Further, the restaurant offers several breakfast options with various price points, which are highlighted brilliantly in the colors of green, orange yellow and red. The restaurant menu setting presents a vibrant and friendly ambiance. This template is ready for download and use.